Once occupied by Cistercian monks from Clairvaux Abbey, the seat of the House includes some magnificent 12th-century vaulted cellars. Moving on to the more recent past, the ancestral tree of the Drappier Family has its roots in the 17th century, with the birth in 1604 of Remy Drappier, who like Nicolas Ruinart becomes a cloth merchant in Reims. His grandson Nicolas (1669-1724) was a public prosecutor in the reign of Louis XIV. One must wait until 1808 for one of the ancestors of the House, Francois, to move to Urville and begin working a vineyard which today extends over 55 hectares. In Urville, at the beginning of the 1930s, the vineyard suddenly erupted with heated discussions. Georges Collot, maternal grandfather of Michel, the present head of the House, was the first to decide to plant Pinot Noir in the region. His decision caused some amusement and he was nicknamed « Father Pinot ». This grape variety now represents 70% of Drappier’s vineyards and almost three quarters of grape production in the local area. Michel believes in minimal intervention and has had his modern winery built in such a way as to enable gentle gravitational movement of grapes, musts and wines in the winemaking process. This allows him to carry out a low sulphur regime which ties in with his practices of controlled oxidation of musts, contributing to the distinctive style of this Champagne House. 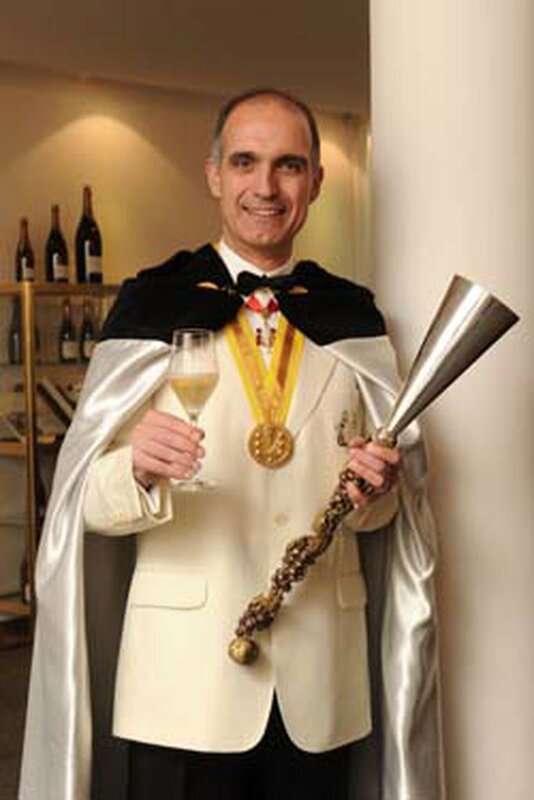 Michel Drappier, President of Champagne Drappier, has been named Commandeur of the Ordre des Coteaux de Champagne. The transfer of office took place at the premises of Champagne Drappier in Reims in the presence of an important delegation of the Conseil Chapitral and leaders of the Champagne trade. Established in Urville in the Cote des Bars region since 1908, our family today grow a 75 hectare (99-acre) estate. Charles de Gaulle, an epicurian neighbour in Colombey les Deux Eglises, came to adorn his cellar with our most famous cuvees. Planted by the Gallo Romans circa 1 AD, our vineyard was one of the first to be improved by the Cistercians of the Clairvaux Abbey. Saint Bernard participated in the building of our 12th Century cellars. The strong-flavoured cuvees aging here are then shipped to the best tables on the five continents. Elegant on the nose and crisp on the palate, this Champagne is Composed of 100% Chardonnay from the first pressing only, which links elegance and richness together. Each bottle is signed "Drappier" in gold, the signature of a great Champagne. A 100% Pinot Noir cuvée. A 100% Pinot Noir cuvée, a 100% first pressing as is always the case in the Drappier house, but with no dosage. In fact no liqueur d’expédition (sugared liqueur) has been added. All that remains is the natural residual sugar amounting to 2 grams per bottle. The Drappier vineyard extends over more then 75 hectares and represents the essential, typical and authentic nature of the Drappier’s cuvees. Since 1808The family of Drappier have applied their expertise in selecting parcels of land particularly well exposed to the sun and rich in limestone. They produce expressive and aromatic wines. Champagne Drappier’s principal growing areas are: Urville, Berferes, Bouzy, Ambonnay, Marueil-Sur-ay and Cramant. In an area rich in history and tourist attractions, the cellars, constructed By the monks of Clairvaux Abbey in the 12th century are located only 14 Kilometres from Colombey-Les-Deux-Eglises, the resting place of Charles de Gaule. A former customer of Maison Drappier. Only cuvees are used on a membrane press. From the press to the tanks without pumping. Natural decantation. Temperature controlled for 14 days of fermentation. Racking and malolactic fermentation straight away at a temperature of 18°C. Fining at a low temperature, two to three years on the lies at cellar temperature, 11°C. 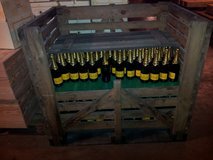 The wine rests a minimum of four months after disgorging before shipment. Established in Urville in the Cote des Bars region since 1908, the family today grow a 75 hectare estate. Charles de Gaulle, an epicurian neighbour in Colombey les Deux Eglises, came to adorn his cellar with their most famous cuvees. Only cuvees are used on a membrane press. From the press to the tanks without pumping. Natural decantation. Temperature controlled: 18°C 14 days of fermentation. Racking and malolactic fermentation and filtering. Two to three years on the lies at cellar temperature (11°C). 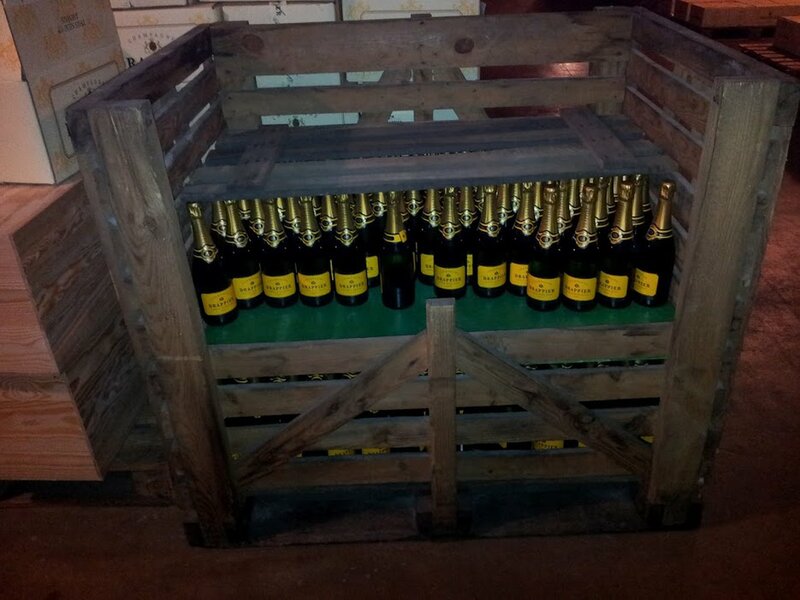 The wine rests a minimum four months after disgorging before shipment. Nearly a Blanc de Noirs. Low level of SO2. Very little pumping during the process. Natural fining in winter. Dosage with a liqueur matured in oak barrels . At the end of a particularly slow second fermentation, the vintage wines mature for many years in the cool darkness of the Reims cellars, dug from the chalk during the last century. Our Special cuvées and larger bottles, which are the pride of the house, are laid down in our 12th Century cellars in Urville. 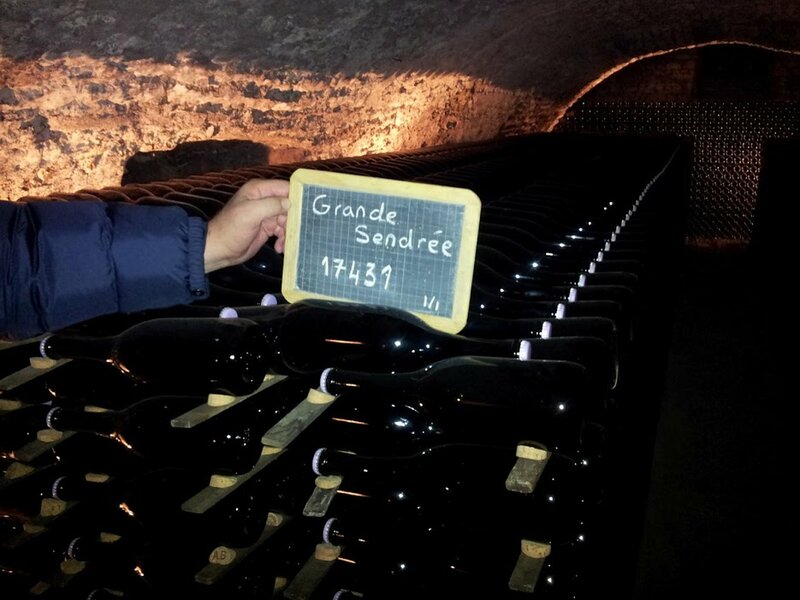 Grande Sendrée is produced from a plot of vines planted over 70 years ago. This "cuvée" is today a blend of highly fragrant wines produced in very small quantities. Chardonnay, of which there is 55%, confers finesse and elegance, and Pinot Noir 45% gives body and fruit. The vineyard extends over more than 75 hectares and represents the essential, typical and authentic nature of the Drappier's cuvees. Since 1808 the family of Drappier have applied their expertise in selecting parcels of land particularly well exposed to the sun and rich in limestone. They produce expressive and aromatic wines. Champagne Drappier's principal growing areas are: Urville, Berferes, Bouzy, Ambonnay, Marueil-Sur-ay and Cramant. Produced from Drappier vineyards. Traditional vinification using the saignee method ensures an intense bouquet and subtle aromas of red fruits. After bottling stored on lattes in the cellars for more than two years.